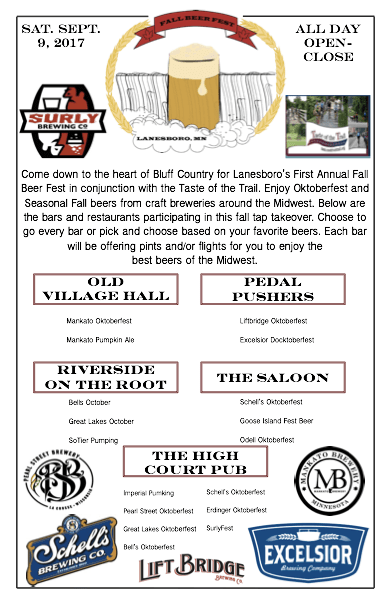 Come down to the heart of Bluff Country for Lanesboro’s First Annual Fall Beer Fest in conjunction with the Taste of the Trail. Enjoy Oktoberfest and Seasonal Fall beers from craft breweries around the Midwest. Below are the bars and restaurants participating in this fall tap takeover. Choose to go every bar or pick and choose based on your favorite beers. Each bar will be offering pints and/or flights for you to enjoy the best beers of the Midwest.